From the pile of newsprint I’ve amassed in figure drawing class, this loose sketch stands as my favorite. During a break while the instructor was lecturing, the model draped a cloth around her torso and sat on the platform checking her voicemail. 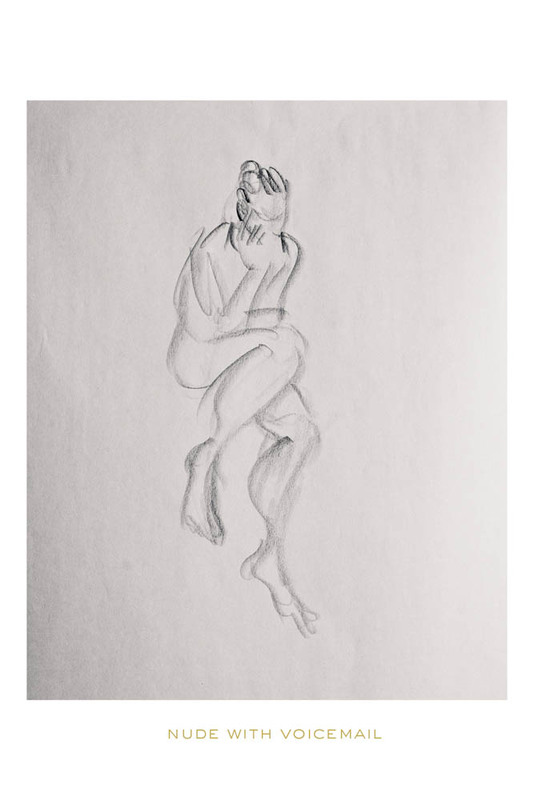 Sometimes we talk about understanding the story behind the pose to bring life to our drawings, but the realness in this semi-private moment made that easier than the usual twists and bends without object. 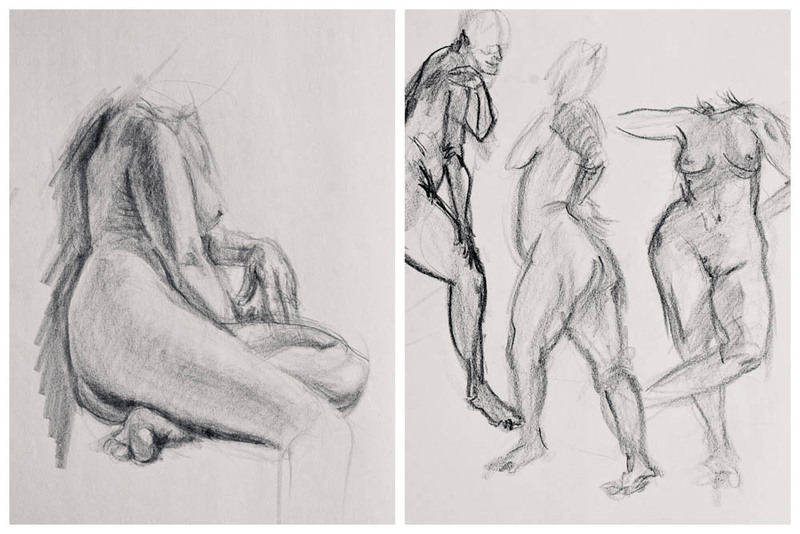 I’ve been taking a figure drawing class taught by Karl Gnass at the American Animation Institute, with the aim of developing a familiarity with the human form that will help me draw better lunging avocados. 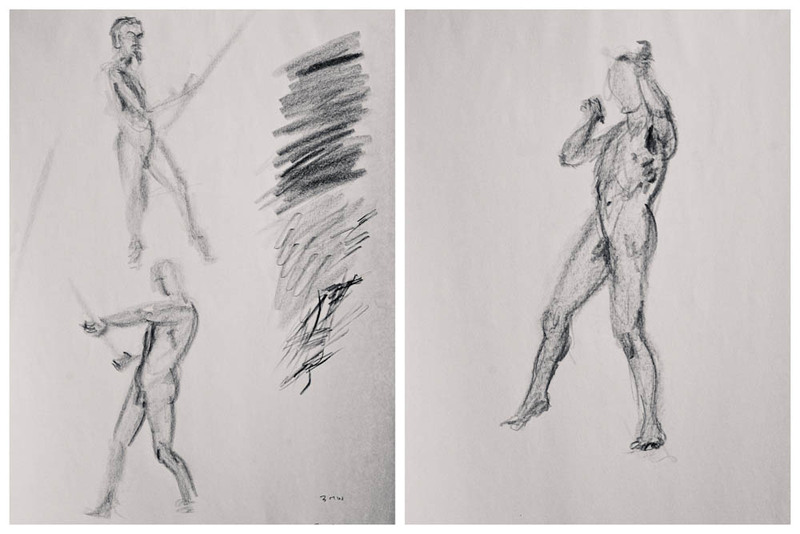 These are some samples from the last few months, and compared to the results from a brief encounter with figure drawing some years ago, I can see improvement. It is a slow process, but it is encouraging to see some movement. Most of the poses in the three hour sessions are less than five minutes. There have been a couple nights where Karl talks about rendering with tone and poses stretch upwards of 20 minutes, but for where I’m at, I prefer the shorter poses. I’m not there to make pretty life drawings. I’m trying to develop familiarity through repetition. Each short pose is a chance to take a new visual impression and strengthen my mind’s recognition of its distinctive aspects. As I do this over and over, I find there are times when I notice some detail I had previously overlooked and in that way my awareness of what I am seeing grows. Three minutes definitely feels longer now than it did when I started the class. 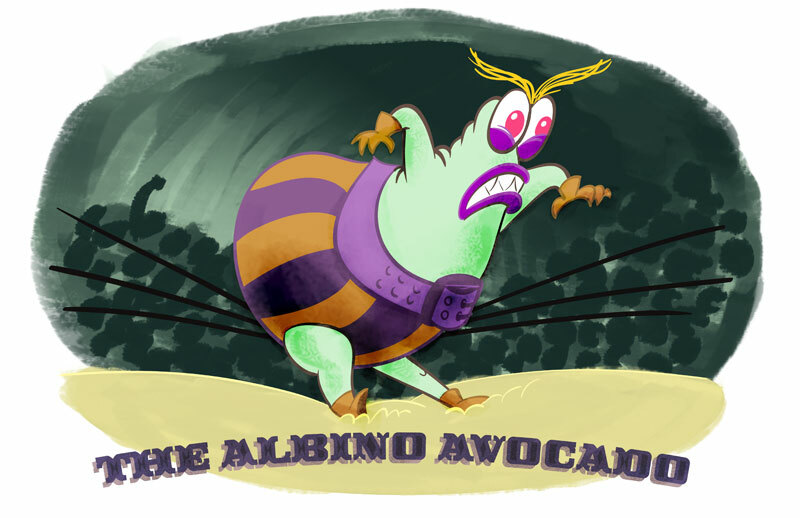 I just finished this for the first project over at Toaster Doodle. Check out the Toaster for a detailed breakdown of the Thousand Step™ design process, and some fantastic wrestler character designs by the other Doodlers. I scanned a thumbnail sketch of a street scene from a while back and played around with painting it in Photoshop, with the goal of building familiarity with mixing colors and tweaking brushes in the program. For the first version (upper left), I selected colors using the eyedropper on the original photograph. For the next two, I looked at other pictures and paintings and mixed colors using the HSB sliders in the color palette, trying to copy some of those images’ color biases in light and shadow. In the last version (lower right), I just mixed colors based on what I remembered from the previous scenes and tried to use colors across the image that felt related. 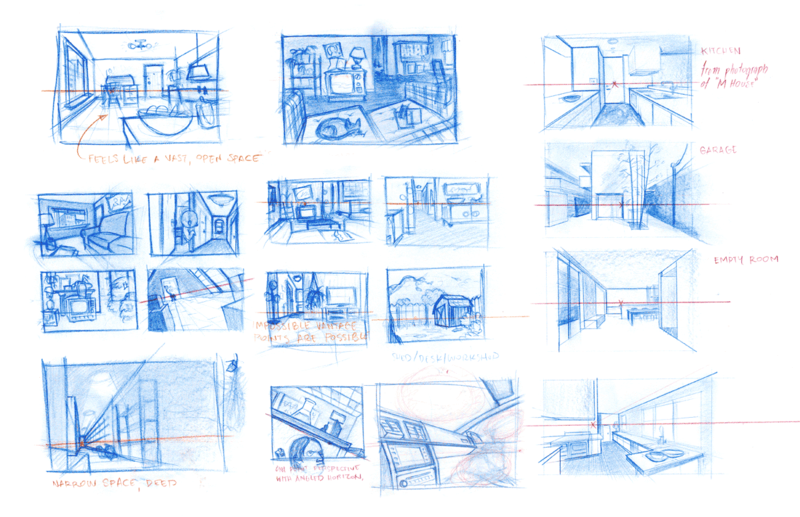 I’m trying to get used to building drawings using an incremental process, sketching and refining with loose thumbnails. 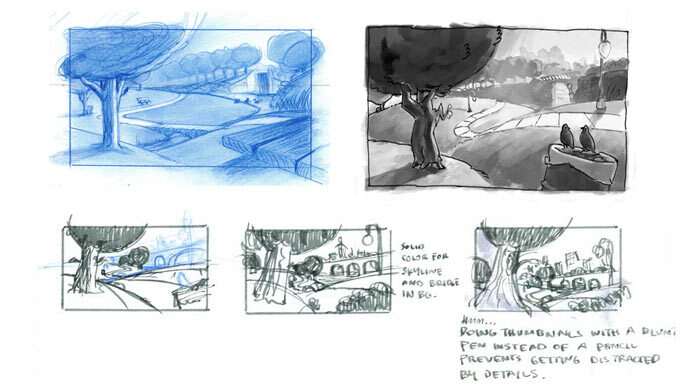 Then enlarging a thumbnail to use as the basis for a larger rough. 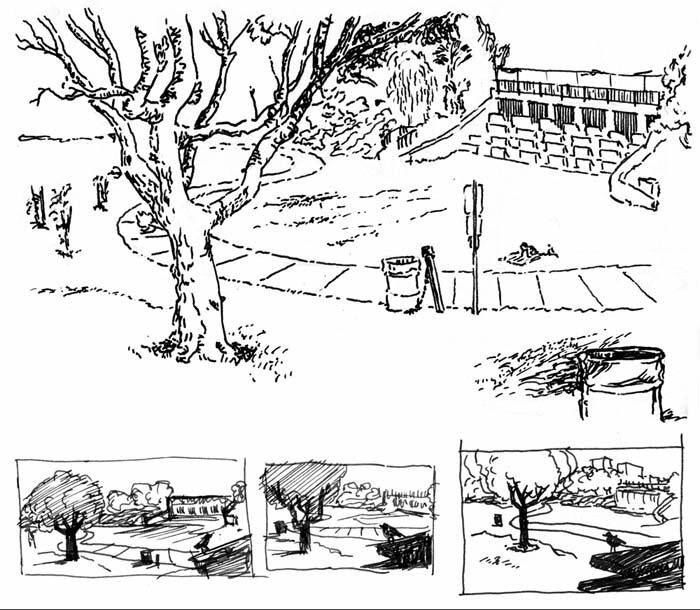 This park scene started out as a sketch from Pan Pacific park before it diverged from reality in thumbnails to become a more idealized urban park landscape. 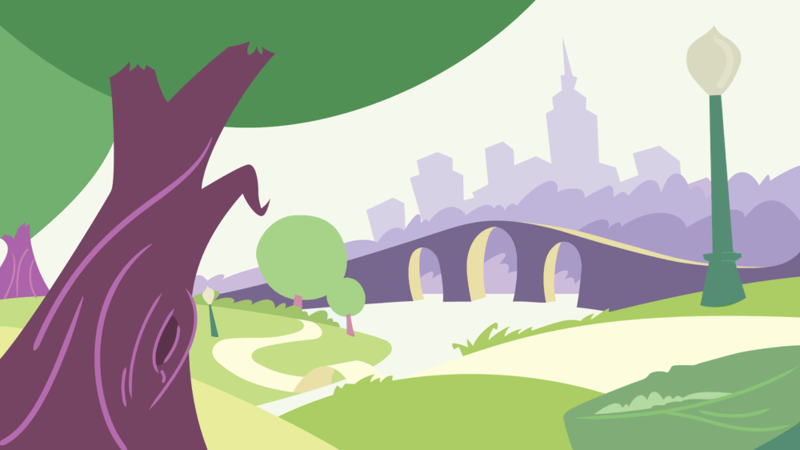 In the two value studies I did, I kept getting sucked back into rendering detail, but after a few more thumbnails, I whittled the composition down to something simple that I cleaned up and colored in Illustrator. 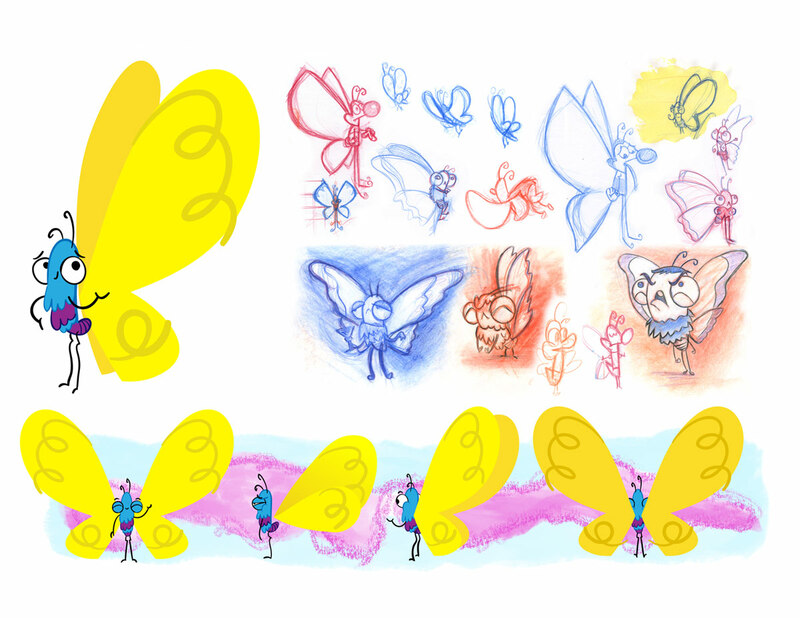 I’m taking the background design course this semester at the Animation Academy taught by Robert Gold and Danny Picar and looking forward to being able to put my characters in environments that are more than a brushy blob of color! 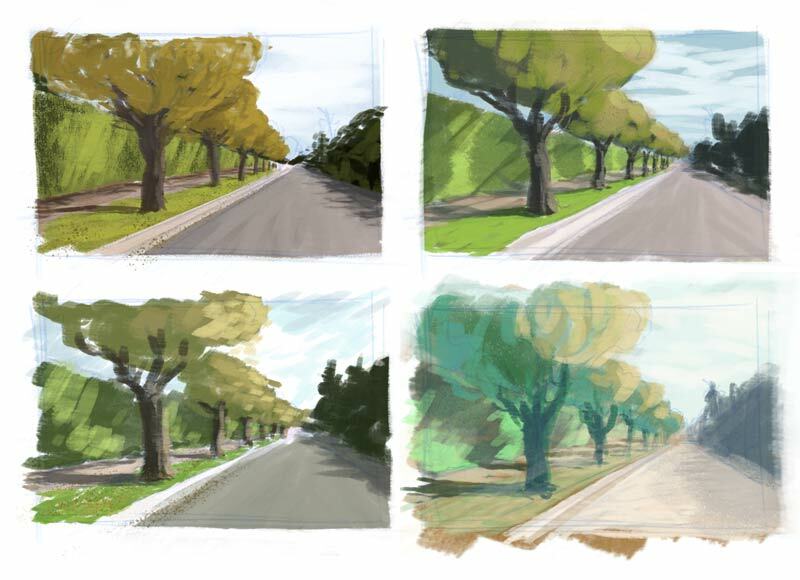 It’s been a while since I’ve invoked the formal rules of perspective in a drawing, so in these thumbnail sketches I’m trying to get a sense for how the vanishing point and horizon line work in environments that are not simply a road stretching off into the distance. 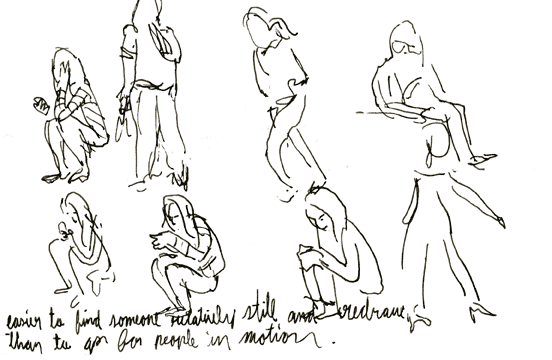 People, however, will hardly stay in one position very long before reconfiguring their limbs and posture into a completely different pose, with the subtle gestures of action the most fleeting of all. To work quickly, I tried drawing small and what you see here are some of the better results from a few pages of sketching. 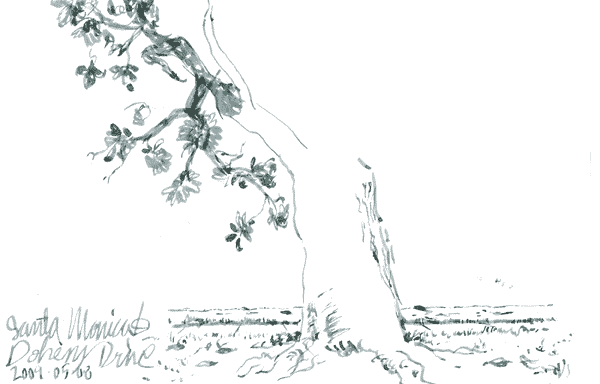 The tree is a more cooperative model, and I enjoyed experimenting with different pen strokes to suggest the textures of surfaces and edges present in the scene. 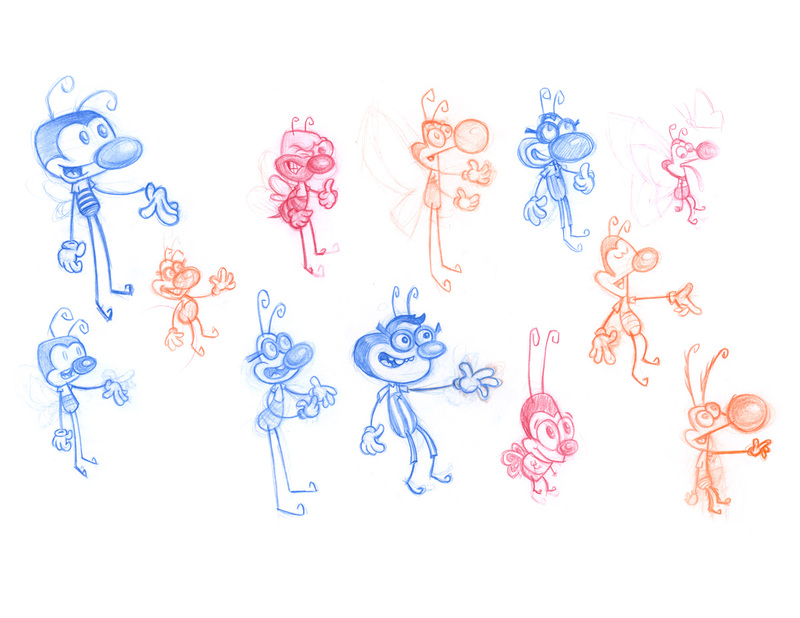 Sketching like this feels like teaching the hand to dance. 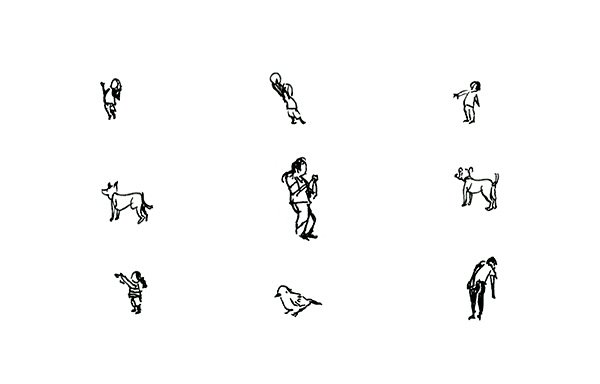 Rather than copying the scene line for line, I’m interpreting visual patterns into evocative rhythmic hand wiggles, and the drawing emerges as a recording of that dance. I think I understand what he’s talking about, and have felt this strong empathetic connection with the subject at times when drawing feels most fluid, but it’s a state of focus that is difficult to flip on and off like a light switch. 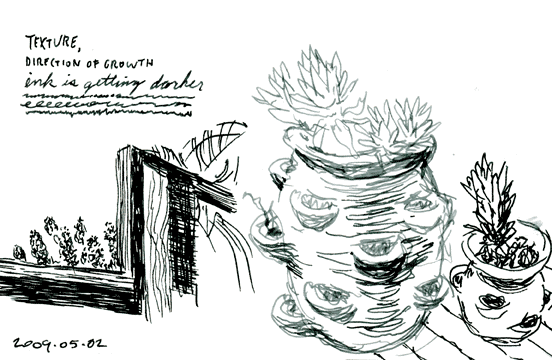 Interestingly, I’ve found that there’s something about drawing quickly can help engage this sense. I bought the cheapest fountain pen that I could find a few weeks ago, and it’s been more of a treat than I expected. The fountain pen has a feel different from the ballpoint and rollerball pens that replaced it as the office mainstay, and its characteristics make it well suited to quick sketching. It takes very little pressure to make a line, and the ink flow keeps up with fast strokes when other pens might start to skip or sputter. The fountain pen does demand more care and attention than disposable pens, though. It wants to be stored upright to keep ink from drying in the nib. Standard fountain pen inks are not waterproof and the waterproof one I’ve tried is not a very deep black and requires a lot of scribbling to get flowing after the pen sits. The light lines in the drawings above come from refilling the ink before letting the nib thoroughly dry after washing it out with water, so I’m still getting the hang of that ritual. I’ve also heard that fountain pens don’t take well to air travel, where changes in air pressure can force them to leak. All in all, a fun tool to have in the box, but maybe not the pocket (at least without a pocket protector). 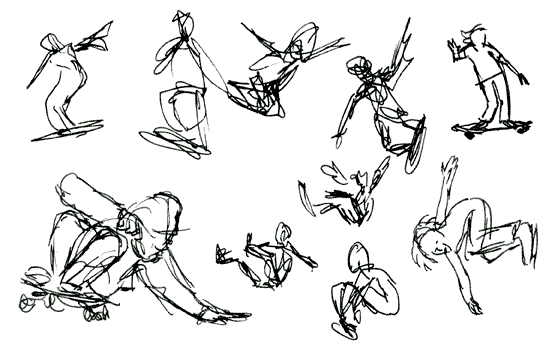 Gesture drawing is something I haven’t done much of. I never saw the point of making scribbly loose drawings that didn’t look much like the thing I was trying to depict, instead preferring to work around the outside of the subject and define it with contour lines. 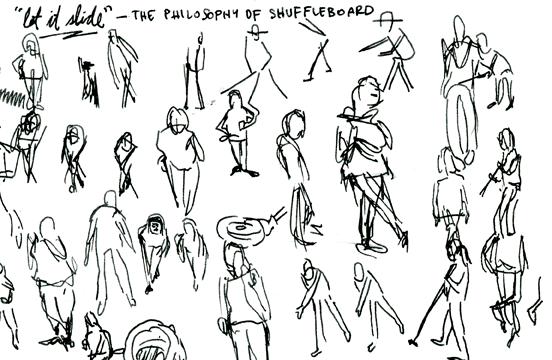 But I’m about halfway through the first volume of “Drawn to Life”, the compiled notes of Disney animator Walt Stanchfield , and the point of those scribbles is starting to become clear. When I first cracked the book, I was surprised to see so many words in a thick book about drawing, but Stanchfield’s lecture notes from years of drawing courses given to Disney artists reveal the mind of a man with a great understanding of his own process and purpose in creating and a desire to share these things with others. In studying the drawings in the book and trying to approach drawing in a way that produces a similar result, I’ve found that making quick, loose drawings is liberating. 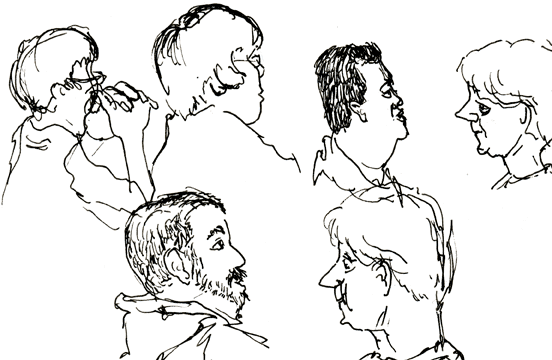 The point of gesture drawing is not to make a fine rendering of the subject on a piece of paper, but to engage the mind and the eye in noticing the angles and shapes that communicate most strongly — to develop an awareness of body language that the animator can draw on when bringing to life figures of the imagination. 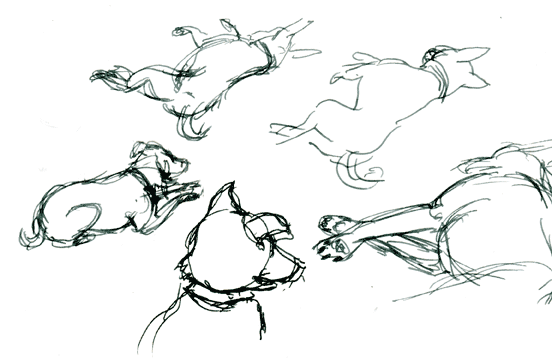 Gesture drawing is a technique for learning! Stanchfield recommends drawing in ink to encourage the mind to develop a greater sense of intent before placing a mark, and I have to say it feels like the equivalent of weight lifting for drawing. After spending some time working in ink, the pencil feels lighter and more fluid in my hand. Don Hahn, who compiled the Stanchfield’s notes for publication and produced “Beauty and the Beast” and “The Lion King” among other films, is going to be appearing at the next Animation Night at The Animation Academy in Burbank on June 7th. If you’re in the Los Angeles area, come check it out. Sadly, Stanchfield passed away in 2000, but many thanks to Hahn for the wonderful job he has done preserving Stanchfield’s spirit and sharing it with other artists through these notes.